The topic of solar energy has taken positive and negative ‘hits’ over the last thirty years. Initially thought to be an exciting advantage to move into the world of renewable energy, the average business and private citizen were given incredible tax savings to try to offset the head spinning high costs. Later, these savings were removed, and even though solar prices have come down considerably, the jury seems to still be out as to the actual savings in the long run. A group of people getting together in Sydney, Australia at the 2nd Summer Study into Energy Efficiency and Decentralized Energy are now rethinking the whole topic and changing the slant towards battery storage technology. Some of the problems that are faced for solar power are that not all households and businesses have the ability to take advantage of it as well as the fact that much of the power that is gained is often sent back into the grid, making the cost savings at a lower rate. To maintain solar power as a productive energy source with a good return on investment, the cost either has to come down a lot more or alternatives need to be explored. There are companies that have already designed and created battery storage technologies and the options are growing exponentially. The design is based on the numbers for consumption. If there is a large home with a lot of consumption, both solar PV as well as battery storage can be used. 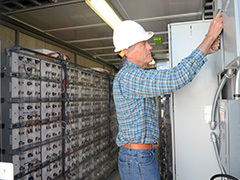 The battery storage will allow less power to be drawn by the grid as well as less power sent back to the grid. This will give the home owner the ability to use their own power, and experience a cost savings. There appears to be a fine line for the design, so that everyone wins. The balance needs to be configured as long as the solar PV LCOE is greater than the export to the grid. It’s estimated that the size for the best fit for the solar module is one that only supplies the house. The battery system addition will only work if the battery LOCE and the solar module is below the grid cost. Posted on June 11th under Renewable Electricity. There are lots of people that would love to have solar for their homes, but can’t afford it. It’s a big problem when we are all expected to stretch out the resulting savings over twenty years before it pays off. Solar is a great idea, and I am glad to see that someone is finally looking into the battery storage situation. With solar, if you don’t use it – you lose it and not enough can be added into the grid to make it worth it. I looked into solar a few years ago because I thought it was the right thing to do and it would save me money. Boy was I shocked to find out the cost and what I would have to do. First, I had to spend $3,000 removing trees in my yard. Next, my roof is older, and they told me that if I had to have to roof redone, I would lose my solar for the length of time I needed to get a new roof. Lastly, and this is the biggy, I could only get an energy benefit while the solar panels were collecting energy. This new battery storage would at least resolve one third of my problems.